Nationally Board-certified in family practice and peri-operative nursing, Dr. Patricia Rodriguez-Hudson, '96 DNP CRNP RNFA has over 30 years of healthcare experience in the clinic as well as the operating room. 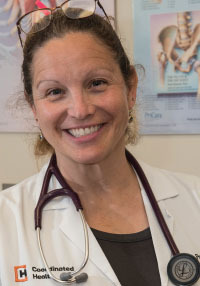 Rodriguez-Hudson is a Certified Registered Nurse Practitioner at the Coordinated Health Hazle Township, Pennsylvania campus as well as the founder and director of Country heart farm 501c3 Therapeutic Animal sanctuary. "They may forget your name, but they never forget how you made them feel," is one of Rodriguez-Hudson's favorite quotes. The sentiment best describes her holistic approach to healthcare. "I work with up to 30 patients per day, ages two and up," states Rodriguez-Hudson. "I can see the full spectrum of family practice in one day. If you can imagine it as a diagnosis I see it." Her practice location offers many specialty services as well as onsite x-ray and labs. Rodriguez-Hudson is a nurse practitioner. NPs can prescribe medication, examine patients, diagnose illnesses, and provide treatment, much like physicians do. In fact, nurse practitioners have what's referred to as "full practice authority" in 20 states, meaning that they do not have to work under the supervision of a doctor. Pennsylvania is currently voting on a bill to be one of these states. "I have full prescriptive authority," says Rodriguez-Hudson. "I evaluate, examine and order every type of test. I am also a Registered Nurse First Assistant which allows me to be the first assistant at the table for major surgical procedures in the operating room. My patients love the fact that I see many of them for primary care and then go into surgery with them and be the first assist. I'm their familiar face and voice; I hold their hand and talk to them before the anesthesia kicks in and sometimes when they wake up." Rodriguez-Hudson's practice and home are in the Hazleton area where she raised all five of her sons. She grew up in a small coal patch town in Hazle Township called Stockton #6 which consisted of 13 houses. "I didn't have indoor plumbing until fourth grade," she admits. Rodriguez-Hudson knew what she wanted to do for a living since she was four years old. "I put on my hat, grab my doctor's bag and stethoscope and check everyone in the house before I would even get dressed in the morning," she recalls. "I called myself 'Nurse Miller' for some reason and did my rounds on my family and pets." As she grew older, Rodriguez-Hudson took on health care jobs as a candy striper, then became a nurse assistant. She earned her LPN from Hazleton Area Diploma Nursing program not long after she graduated high school. Rodriguez-Hudson returned to pursue her RN while raising three little children. "I applied to Luzerne County Community College," she said. "The College was close by, affordable, and it worked with my life." Rodriguez-Hudson had never attended a college and admitted she was terrified. She started taking one class at a time and worked her way through graduation. She continued at LCCC after graduation to obtain her Perioperative Nursing Certification. "The peri-operative certification was a great professional leg-up experience," she shares. "You have to take advantage of the opportunities in front of you." The Nursing program at LCCC wasn't a cake walk Rodriguez-Hudson admits. "LCCC's nursing program is stringent. The professors tell realistic stories of their experiences that really show you what to expect in this field. It's a great profession to be in right now - so much has evolved in the Registered Nurse's world. Rodriguez-Hudson continued through Misericordia University's Expressway program and earned her Bachelor's Degree, then finished her Master's Degree, Family Nurses Practitioner degree, and clinical doctorate as a DNP. When Rodriguez-Hudson is not in the office providing family health care, she can be found at Country Heart Farm, the 501c3 nonprofit therapeutic animal sanctuary she founded in 2016; on a medical mission trip; presenting at various national conferences; or improving her Equine Assisted Growth and Learning Association (EAGALA) skills for her horses. She has a passion for health, wellness and healing of the individual, family and community. Country Heart Farm, Rodriguez-Hudson?s therapeutic animal sanctuary, offers equine and animal assisted growth, learning and therapy visits on and off site. The farm offers a retreat from everyday life where children, adults, and animals of all ages, stages, backgrounds and abilities may find peace, happiness, and healing. "We currently offer Equine Assisted Learning experiences, animal and equine assisted therapy visits using the EAGALA framework and model," Rodriguez-Hudson points out. "Country Heart Farm also offers various recreational-based wellness programs that incorporate the great outdoors and our animals." She says the farm includes rescue and therapy animals such as a goat, two Great Danes, American Hairless Terrier, horses, pot belly pigs, plus miniature and full-size horses. Rodriguez-Hudson still keeps a photo of her favorite LCCC professor, Dr. Dana Charles Clark, in her office. "As a teacher, Dr. Clark had a tremendous impact on my drive to become a truly professional nurse," she says. "LCCC was a phenomenal foundation. The College introduced me to academics and reinforced the skills I had learned so far. What we learned at LCCC in the two year associate degree program prepared me for the same state boards that students in the four-year schools took. I refer a lot of people to Luzerne County Community College. Two of my staff members are currently enrolled in LCCC's nursing program." Coordinated Health is currently building a new hospital in Humboldt Industrial Park in Hazleton where Rodriguez-Hudson will have her own primary care suite. She also recently presented at the 2018 Consortium of Multiple Sclerosis Center's annual conference in Nashville, Tennessee. Her topic was her original research on The Effects of Hatha Yoga on Relapsing Remitting Multiple Sclerosis Related Fatigue. Her research found strong evidence that hatha Yoga actually helped to reduce MS related fatigue. "Nursing is not for the faint of heart," she stresses. "You have to like people, It's not a glamorous profession, but it's very rewarding. If you really want a job in this field after passing your boards you should be able to find one."